It seems slightly surrealistic that Iraqi politics should still be focused on the institution of the presidency these days: Since the transitional period outlined in the Iraqi constitution came to an end in November 2010, the president (Jalal Talabani of the Kurdish alliance) holds a mostly ceremonial office whose sole remaining prerogative of any significance is the power to introduce bills to parliament (crucially it no longer has any veto right). The deputies to the president – specified in the constitution as “one or more” and in a bill passed in January 2011 limited to “maximum three” – have no constitutionally defined powers whatsoever except what is delegated to them from the president’s own limited remit… Full story here. Prime Minister Nuri al-Maliki created headlines last week when he was quoted by some media sources as having said that the Iraqi parliament “has no right to legislate”. Recently, there has been an angry rebuff from parliamentary speaker Usama al-Nujayfi of Iraqiyya who identified legislation as the core task of the parliament. Some politicians are complaining that “relations between the legislature and the executive are deteriorating”, and the quarrel comes at a time when agreement between Maliki and Nujayfi remains key to getting the security ministries passed and having an honest debate about the question of the US presence in Iraq after 2011. The reason for the misunderstanding is probably that Maliki’s statement may have been an attempt at paraphrasing ruling 43 by the Iraqi federal supreme court of 12 July 2010. In the case leading up to that ruling, the previous Maliki government had complained about parliament’s passage of a law passed by parliament that cut ties between the municipality and public works ministries and the governorates. Maliki’s lawyers furnished a multitude of legal arguments in defence of their case, but above all they focused on article 60 of the constitution. That article identifies two ways of initiating a legislative project (mashru): Either it must come from the cabinet, or it can be presented to parliament by the president. On the other hand, a proposal (muqtarah) for a law can be initiated by members or committees in parliament, but Maliki’s lawyer made the case that the two categories – project and proposal – are two entirely different things, and that a proposal must be developed into a project, by the executive, before it can be considered by the parliament. In comparative perspective, this kind of executive–legislature relationship is unusual but not entirely unheard of. For example, in the European Union – admittedly a somewhat exotic specimen in the family of democracies and a confederation more than a federation – the parliament has no right to initiate a process of legislation, since member countries see this as potentially undermining their “minority rights”. Also, in several presidential systems in Latin America, the parliamentary initiative is restricted to certain areas of legislation, and may for example not include budgetary or military and security affairs. Iraq may be closer to the EU example, since cabinet decisions in Iraq require some kind of minimum consensus whereas a strong president in Latin America (Brazil and Chile are among the examples) can make decisions on his or her own. Unless the Iraqi parliament moves forward on the legislative project of creating a new federal supreme court that can come up with a new constitutional interpretation, it will have to live with a situation in which legislation starts with the executive. 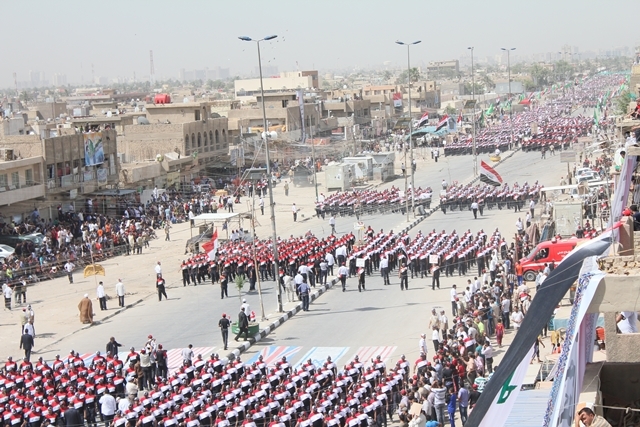 What both executive and legislature need to think about in Iraq these days are increasing signs of political mobilisation on the margins of parliament: The Sadrist demonstrations on Thursday, variously estimated at between 20,000 and 50,000 participants, surpassed any “Arab Spring” demonstrations in scale. As such, they served as a reminder of the possible implosion of the “moderate centre” in Iraq – whatever that may exactly mean – unless this centre stops bickering over useless details about vice-presidents and their prerogatives (and most recently, rank) and starts focusing and acting instead on those big issues in Iraqi politics that really count. Unfortunately, the sheer eloquence of President Barack Obama’s Arab Spring speech only served to underline some of the fundamental contradictions in US policy towards the wider Middle East region. True to form, the US president made sure to enliven his remarks by incorporating stories of individual destinies into the more abstract themes of Washington’s policy towards processes of democratisation in the Middle East. He mentioned the experiences of protesters in Tunisia (“the street vendor of Tunis”), Egypt, Libya and Yemen. There was even a reference to Damascus. There was no such special reference to Manama, the capital of Bahrain. It is true that in a later section of his remarks, Obama did comment on the situation on the island, albeit briefly. But in that particular case he refrained from sympathising with or personifying the protesters, relying instead on boilerplate phrases focused on “dialogue”, not dissimilar from what any US president could have come up with. There was even a silly reference to the effect “that the Bahraini government has a legitimate interest in the rule of law”, as if to legitimise the government discourse that the demonstrators were primarily made up by criminals. What a joke. The problem in the case of Bahrain is that the feeble attempts at dialogue between rulers and ruled – always with foreigners with vested interests in the country standing by as onlookers and more or less passively supporting the status quo – have been going on for quite some time. And, unsurprisingly, there were hints that pockets of radicalism were unrepresentative, perhaps even of foreign origin? In a report dated 18 February 1935, a British official carefully pointed out the distinction between “country Baharina who are decent folk” and “certain evil townsmen” who were trying to “lead them astray”. That was of course exactly seventy-six years ago, but the parallels to the way in which the US government is approaching the same ruling family today are quite striking. Back then, the British would typically censure only the worst of the excesses of the Al Khalifa. Indeed as late as in the 1950, only the most extraordinary in terms of mistreatment of the Gulf population by their Arabian rulers would ruffle feathers in British circles, as seen in a report from a British diplomat in Jeddah dated 5 March 1950: “We have noticed at para 14 of the Bahrain intel summary for the latter half of January that a Bahraini is reported to have been flogged to death at al Khobar [in Saudi Arabia, not even mentioned by Obama] for the heinous crime of playing a lute. We should like to have any confirmation of details of this which you may possess. We are as you know concerned with the administration of ‘Saudi justice’ as it affects British protected persons working here as well as citizens of the UK”. Fast forward to today’s situation when Obama says “Shia must never have their mosques destroyed in Bahrain” and demands that prisoners must be released from jails. These are tiny steps forward compared to what is truly required. Obama juxtaposed his meek call for dialogue in Bahrain to the situation in Iraq, which he appeared to highlight as a shining example of how multi-sectarian democracy can work. Two comments are in order in this respect. Firstly, sectarian conflict in Iraq and sectarian conflict in Bahrain are two completely different animals. Sectarian tension in Bahrain incorporates an ethnic component that is altogether absent in Iraq: Most Shiites of Bahrain consider themselves as “Baharina”, the indigenous, agriculturalist population of Bahrain that became subjected to the rule of raiding Bedouins from Arabia in the eighteenth century. As if to underline the overlapping dichotomies of sect, myths of origins and ecological patterns of adaption, as late as in the 1930s the Bahraini ruling family (Sunni, recently settled Bedouin) would let their camels graze freely around the island including in the gardens of the agriculturalists (Shiites, original Baharina)! Even the British got slightly concerned about “a complaint of long standing [among the Baharina] that the Al Khalifa camels eat their crops.” By way of contrast, Sunnis and Shiites in Iraq both see themselves as descendants of the Arabian tribes and often try to outbid each other in proving their attachment to Arab tribal values. True, correlations between sectarian identity and myths of descent like those seen in Bahrain exist in other GCC countries too, but in many cases they are mitigated by a degree of further complexity and subdivision within both Sunni and Shiite camps, since there are often both Sunnis and Shiites of Iranian descent involved (as seen for example in Kuwait). But in Bahrain, the majority of Shiites are also Baharina and this adds a special dimension to the conflict. Second, Obama, seems to overplay the extent to which Iraq truly is such a wonderful triumph of democracy in the Arab world. Yes, the Iraqis “have rejected the perils of political violence in favour of a democratic process”, as Obama said . (Incidentally, as Obama failed to remind us, they also rejected Vice-President Joe Biden’s agenda of comprehensive federalisation of the Iraqi state.) But even the participants in the current unity of government in Iraq are beginning to criticize the formula of government that was adopted when Maliki was appointed for a second term back in November 2010. 44 ministries and three vice-presidencies are seen as ridiculous and ineffective in terms of providing services for Iraqi citizens, and regular security ministers have yet to be appointed due to ongoing bickering between the many members of the oversized government. The truth is that in today’s Iraqi “democracy” parliamentary politics has lost much of its meaning since almost every decision of significance is arrived at behind close doors outside the parliamentary compound. If he is genuinely interested in safeguarding regional stability in the Gulf, Obama ought to go beyond “dialogue” in Bahrain and do a more critical evaluation of “multi-ethnic democracy” in Iraq. To do that while at the same time making provisions for a post-2011 US presence in Iraq and securing a home for the Fifth Fleet of the US Navy somewhere in the Gulf can prove to be something of a challenge. With the month-long parliamentary holiday well underway Iraqi politics has lost some of its momentum. Despite rumours about imminent “emergency sessions”, a decision on the security ministries still seems some way off. Meanwhile, a decision by the Kuwaiti government to press ahead with a project to build a grand new port on the Bubyan Island, to be named Mubarak Port, appears to be what occupies the minds of most Iraqi politicians these days. Since the project entered the public debate a short while ago, politicians of all stripes have rushed to condemn it. It is interesting that many protests against the project are not focused on the territorial status of the Bubyan Island as such, despite the fact that Iraq claimed ownership of the island for much of the twentieth century and that it featured as one among several elements in the official Iraqi justification for invading Kuwait in 1990. Rather, several of the arguments against the port are of a practical nature. Above all, commentators tend to focus on the fact that if Kuwait finishes its port project ahead of Iraq’s own scheme of a great new harbour at neighbouring Fao south of Basra, Iraqi commerce will suffer. Some even predict that the Fao project will be abandoned altogether as a consequence of the Kuwaiti initiative. 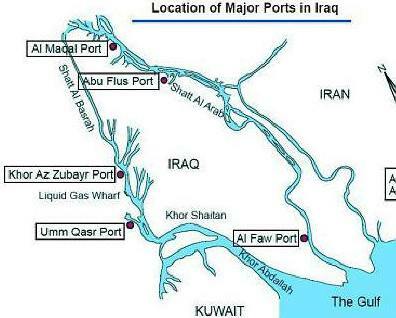 As a result of this focus, the protests may perhaps turn out to be short-lived: Even some of the protestors admit that the Iraqi government itself must shoulder some responsibility for having procrastinated with building port facilities in a more timely fashion at Fao, which would have enjoyed unrivalled access to the Gulf and altogether avoided the problems of the Khor Abdallah – the sound shared with Kuwait in which Bubyan lies and which leads to the Iraqi port of Umm Qasr. It should still be noted that lingering Iraqi claims to Bubyan are not entirely gone, despite the UN demarcation subsequent to the Gulf War. Some legal experts contend that UN boundary commission went too far in settling the maritime border (in addition to the land border), and by using the median of the Khor Abdallah sound instead of the thalweg (the line that follows the natural riverbed). In a recent interview, Tariq Harb – a legal adviser to Prime Minister Nuri al-Maliki – went as far as claiming that the UN demarcation under UNSC 833 was illegitimate or at least disputable given the alleged absence of any Iraqis on the border commission. This seems to misstate the case somewhat, since the Iraqi government was indeed represented through Riyad al-Qaysi and eventually accepted the demarcation (in 1994). Only a more fundamental challenge by the current Iraqi government relating to the very legitimacy of the pre-2003 Baathist government as a representative of Iraq in international affairs would be able to question the post-1991 settlement more generally, but there would still remain difficulties in finding historical arguments for treating the Bubyan (and the second disputed island of Warba) different from the rest of Kuwait. For now, perhaps the most interesting result of the Kuwaiti port project is the creation of a new alliance in the Iraqi parliament that brings together people who usually stand rather far apart but who now all agree to watch the issue of the Kuwaiti port scheme closely. A new parliamentary “formation” (tajammu, thus apparently not a bloc or kutla) was declared Wednesday, with members mainly from the breakaway faction of Iraqiyya known as White Iraqiyya (Aliya Nusayf, Aziz al-Mayahi and Kazim al-Shammari), Iraqiyya itself (Attab al-Duri, Qusay al-Abbadi and Hasan al-Hamdani), Sadrists (Asma al-Musawi , Hayfa al-Atwani and Rafi Abd al-Jabbar) plus Izzat Shabandar (an ex-Iraqiyya member who is now a member of State of Law). So far, of course, this is a small-sized movement and mostly a curiosity. It is probably still a phenomenon that the political leadership needs to take seriously as they move ahead on more important issues like the security ministries and the question of a post-2011 US military presence. It is noteworthy that this alliance brings together both Sadrists and Iraqiyya members (Duri) that have been publicly critical about a post-2011 American presence and if Maliki wants to challenge them on this issue he will need to do more important things than bickering over vice-presidencies. The latter holds true also for the Salih al-Mutlak faction of Iraqiyya which lately has spent time challenging the newly elected vice-president for State of Law, Khudayr al-Khuzai! (According to the law on the deputy presidents, only the president himself has an explicit right to initiate a process of sacking his deputies – parliament can only summon them to question them.) What the vice-presidential vote demonstrated was that Maliki’s dream of a “political majority” is still a long way off – in this case it was threatened through opposition from both Sadrists and ISCI of his own, all-Shiite National Alliance. The latter may well opt to join the Sadrists in opposing any SOFA extension, making it doubly important for Maliki to bring Iraqiyya firmly over on his side if he does indeed harbour a desire to obtain a parliamentary majority for any kind of prolonged US presence beyond 2011. Totally out of the blue, and despite acrimonious exchanges between Iraqiyya and the State of Law bloc of Prime Minister Nuri al-Maliki, the Iraqi parliament today voted to approve three deputies to President Jalal Talabani: Adel Abd al-Mahdi of ISCI, Tareq al-Hashemi of Iraqiyya, and Khudayr al-Khuzaie of State of Law. This latest development must be characterised first and foremost as a triumph for Maliki. State of Law had been talking about three deputies as far back as in November 2010. Reactions from other parties against the State of Law candidate for filling one of the three posts, Khudayr al-Khuzaie, were sufficiently strong that some of them even proposed changing the number and criteria for electing the largely ceremonial vice-presidents: The Kurds, in particular, had invested much energy in demanding a single deputyship, to be filled by a Turkmen (and according to some, a female Turkmen.) But today, the three-person formula prevailed and Khuzaie was duly elected in the single vote that was held on the batch of deputies – again a victory for State of Law, which had insisted on this mechanism. Exactly why Maliki was able to pull this off at this point remains unclear and the reactions from Iraqiyya have yet to materialise. Today’s parliament session was attended by 235 out of a total of 325 deputies. That same assembly also voted to sack Ayyad al-Kinani, who is thought to have Sadrist sympathies, from the independent electoral commission (IHEC). It is noteworthy that at least two Sadrist female deputies have criticised today’s vote. Conspiracy theorists will probably rush to mention the fact that the Iranian foreign minister is in town, posing smilingly with his Iraqi Kurdish counterpart. Whatever the exact reason, the decision certainly signifies that Maliki is still able to get the decisions he wants in the Iraqi parliament, and probably gives him enhanced confidence when it comes to getting the security ministers confirmed. With the vice-presidential deputies confirmed and talk about the strategic policy council fading into the background, those ministries represent the final remaining issue in the government-formation process that started in November 2010. The decision by the Iraqi parliament on 18 April to cancel a clause of an old law dating from 1971 has led to a public debate about presidential prerogatives that reveals just how immature and shaky Iraq’s post-2003 system of government is. The core of the matter relates to the cancellation by parliament of clause 136b in the Baath-era law on the organisation of the courts from 1971 that offered civil servants a degree of of immunity from prosecution in matters related to government service. The measure had been promptly removed by Paul Bremer in 2003 but was reintroduced during the time of Ayad Allawi’s interim government in 2004. In removing the clause, Iraqi parliamentarians made reference to the ways in which it had enabled government officials to protect themselves against accusations of corruption. The substantive issues at hand could merit a separate discussion. However, in terms of constitutional implications, it is the reactions to the passage of this act of legislation that are most important as indicators of the maturity or otherwise of Iraq’s post-2003 political system. It has been revealed that after the law was passed on 18 April, a letter was sent on 26 April from the Iraqi government to the Iraqi president, Jalal Talabani, asking him to take “the necessary constitutional measures to oppose the parliamentary decision to annul clause 136b”. The problem, of course, is that no such “constitutional measures” exist! After the transitional presidency council was abolished in November 2010, the (ordinary) president no longer has any specified veto power since laws issued by parliament automatically come into force after 15 days whether the president opts to formally sign them or not. Had a presidential veto power in fact existed there would have been no need to specify one in the final transitional clauses of the constitution which created the temporary presidency council for the 2005-2010 period. Also, it would not have been logical for the Kurds to seek an extension of the collective presidency council (this was one of their 19 demands for joining the second Maliki government) if in fact the presidency alredy enjoyed veto power, since everyone expected that Talabani would become president anyway at the time when they presented their demands. In a move that seemed conspicuously timed to the 15-day deadline for vetoes that applied to the old presidency council, President Jalal Talabani on 2 May sent a letter to parliament concerning the annulment of clause 136b of the law on the courts. The full text of that letter has yet to be published, but the paraphrases of it that have been circulating in Iraqi media are sufficiently interesting in themselves. Above all, they reveal a surprisingly widespread belief among Iraqi politicians that the Iraqi president still enjoys veto powers! On 3 May, the independent National Alliance politician Sabah al-Saadi told media that Prime Minister Nuri al-Maliki had “told President Jalal Talabani to veto parliament’s changes to the law”. On 7 May, Abd al-Mahdi al-Khaffaji of State of Law suggested that parliament should reconsider the legislation. Comments by State of Law adviser Fadil Muhammad to Al-Sharq al-Awsat on 7 May also seemed to reiterate the belief in “constitutional options” for the president to oppose the legislation, and most recently Jawad al-Shuhayli, a Sadrist of the National Alliance, indicated that “Talabani’s veto would lead to a second vote in parliament”. The correct constitutional interpretation was finally stated in a letter from parliament speaker Usama al-Nujayfi on 8 May, in which he made clear that any attempt by Talabani to oppose the legislation would go beyond his constitutional prerogatives. In a fudged response, Talabani’s office yesterday issued a statement indicating that the 2 May letter was after all not intended as a veto, that the president had acted on letters received from the Iraqi cabinet, and that he “remained committed to the Iraqi constitution”. An interesting complicating factor in the matter is the fact that the parliamentary action of 18 April was based on the first reading of the law which was introduced by government as far back as on 17 March 2007. In other words, it will be difficult for the government to rely on last year’s ruling by the federal supreme court to the effect that laws must be introduced to parliament by the executive only. 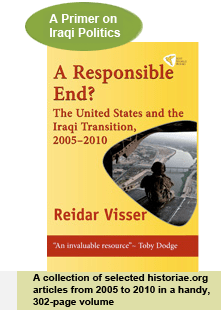 The whole affair shows the extent to which the new Iraqi constitutional framework still remains contested even in those areas where the charter that was adopted in 2005 is reasonably clear. Adding to the complexity is also the tendency of Iraqi politicians to oscillate between the two visions of Iraqi politics that are at stake here – power-sharing versus majoritarian democracy. Normally, Maliki is more majoritarian (as seen for example in the struggle about the security ministers), but in this case that role is actually played by Nujayfi.